A lone worker safety device is a discreet and undetectable tool, app or service which allows for communication with employers, or in more serious situations, emergency services. Lone worker safety devices safeguard employees when travelling, working or meeting unknown people alone. Not only do work alone devices provide a quick and discreet way to reach others in an emergency, they also provide reassurance and confidence for the employees. Lone worker safety devices are aimed to monitor and protect employees operating across a variety of lone working job roles. This could include employees who are required to work in remote locations with low signal areas, employees who are required to meet vulnerable individuals and those required to work with high risk machinery or in hazardous environments. However, lone worker safety devices can also be useful for more secure jobs if the worker is required to be alone, especially where the risk could be unpredictable. For example, if an employee is working out of office hours alone or has meetings with anyone they or the company have not previously met with. 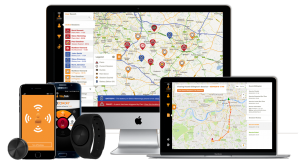 StaySafe’s lone worker safety device works in two parts – the app and the monitoring Hub. The app allows the employee to being a timed session which triggers a period of time where the employee is being tracked. If the session isn’t ended safely, or if the employee fails to check-in at predetermined intervals, an alert is triggered. The lone worker is also able to send a panic alert, discreet panic, duress alert or man-down alarm, according to the challenges they face. Location and user data is visible in the Hub during a session or when a panic alert is triggered. All alerts are sent to the monitor via SMS and email, allowing them to enter the Hub and respond to the alert according to the company’s lone worker policy. How do devices keep lone workers safe? Lone worker devices ensure employee safety through modern technology. Through an innovative tracking solution, lone workers who have become immobile or are involved in a challenging situation, can be identified and addressed in the fastest possible time. Some devices, such as the StaySafe app, also provide a high level of satellite coverage for lone workers operating in more remote locations, where staying in contact can be difficult. Why should my business use lone worker devices? The positive benefits of introducing Lone worker safety devices to employees are undeniable. Not only can they provide reassurance and comfort to many lone workers, but they could change a potentially high risk environment into a safe one, allowing businesses to meet their legal duty of care. The app has been designed for a simple user experience so that it is quick, easy to use and easily adoptable for any sized workforce. Discover the StaySafe app and Discreet Wearable Technology – visit the Lone Worker Solutions page created and designed by StaySafe to provide lone worker safety.